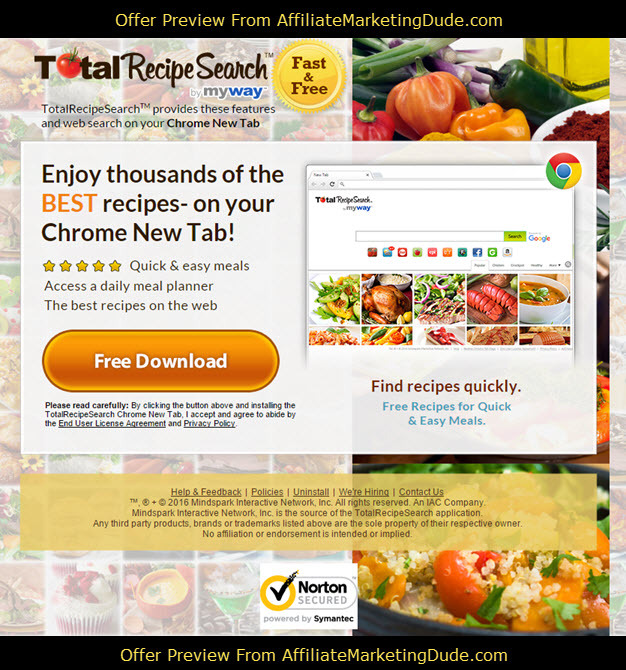 This is a private white label of the Total Recipe Search toolbar from Mindspark. Pixel fires when user downloads and installs toolbar on FF/IE or extension on Chrome. Dynamic Insertion enabled! Customize the LP to showcase specific recipes that can be used to create hyper-targeted ad campaigns. Reach out to your affiliate manager for instructions on how to take advantage of this feature. Traffic: Display, social, search. No pops. No contextual. No incent. POSSIBLE NICHE MATCH UPS: cooking, recipes, cooking times, any recipe ie chili ect. in my experience this can convert close to $0.25 per click.